Adrielle Pyper knows how to plan a wedding, and she is especially good at pleasing bridezillas. But when her biggest client and best friend is murdered just three days before the wedding, Adris world falls apart. She moves to the resort town of Sun Valley, Idaho, and starts from scratch. Thanks to Adris impeccable taste and unique style, she lands two celebrity clients, and her business seems headed for successthat is, until someone vandalizes the specialty wedding dresses she imported from overseas. The race is on to uncover a secret hidden within the yards of satin and lace before Adri becomes the next victim. 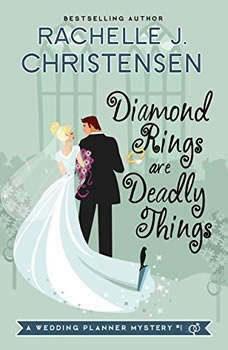 With a delightful blend of mystery, toe-curling kisses, humor, and spine-tingling thrills, Diamond Rings Are Deadly Things is a romantic suspense novel that will keep you turning pages long into the night.